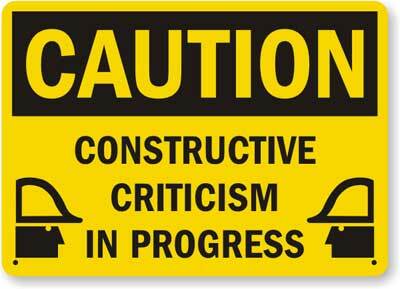 Many experts say that when offering constructive criticism at work you have to stay positive with your employees. That when someone does something wrong on the job that you should start by telling them the good that they are doing. I think that is a very solid way of building a healthy, positive work environment and is something that should be practiced a lot more. It will make offering constructive criticism easier, and the reception of said criticism more favorable, if the employee or coworker consistently hears more positive than negative in the workplace. I used to tutor children with autism for about 4 years. The golden rule for children to learn is 80/20. We strived for more success with every teaching session. If we weren't keeping 80% positive and successful with their learning the children wouldn't improve. We have to do the same with our own employees. Make sure we give them enough responsibility to succeed. Set them up to do well. That way if/when the day comes that an employee don't reach a goal or need to improve in a specific area we can let them know what they've succeeded with and then help them on what they need. But What If They Fail? If a worker makes too many mistakes we then need to pull back the reins on their responsibilities. If they are failing more then succeeding, odds are we haven't done our jobs as managers. Sometimes an employee just doesn’t have the skill set to accomplish a required task and possibly need additional training. This isn’t always the case though and I believe, more often than not, it turns out that a poor-performing employee just has too much to do and aren’t able to keep 80% positive. We need to try and strive to make sure our employees are succeeding more than failing. It makes it much easier to give them constructive criticism, and genuinely try to help them improve, when a mistake happens.